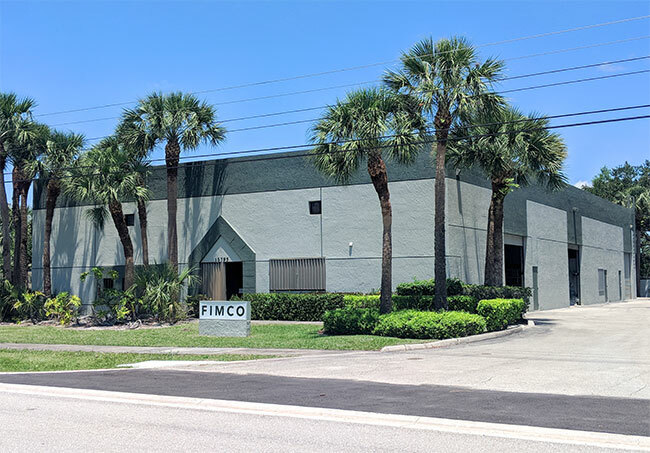 FIMCO is a family owned and operated business that has manufactured quality irrigation products in the United States of America since 1962. We are proud to be the chosen manufacturer of indexing valves for some of the world’s most innovative wastewater treatment manufacturers. Our customers can only expect the best with “Guaranteed FIMCO Performance”. We take pride in our company and look forward to providing you with quality dependable irrigation and wastewater products for years to come. Our hydro-indexing valve runs on water alone. our facility in Jupiter, FL. The 1/2″ Vacuum Relief Valve is designed to provide instant air and vacuum relief. Paired with the 1″ Snap on Saddle that makes for easy installation. This is the low-flow stem & disc assembly for the 1000 or 2000 series indexing valve. It is designed for flow rates of less than 10GPM. The FIMCO Hydro-Indexing Valve is a great alternative to individual solenoid valves. One valve can replace up to eight 1″ solenoids or six 1 1/4″ or 1 1/2″ solenoids. 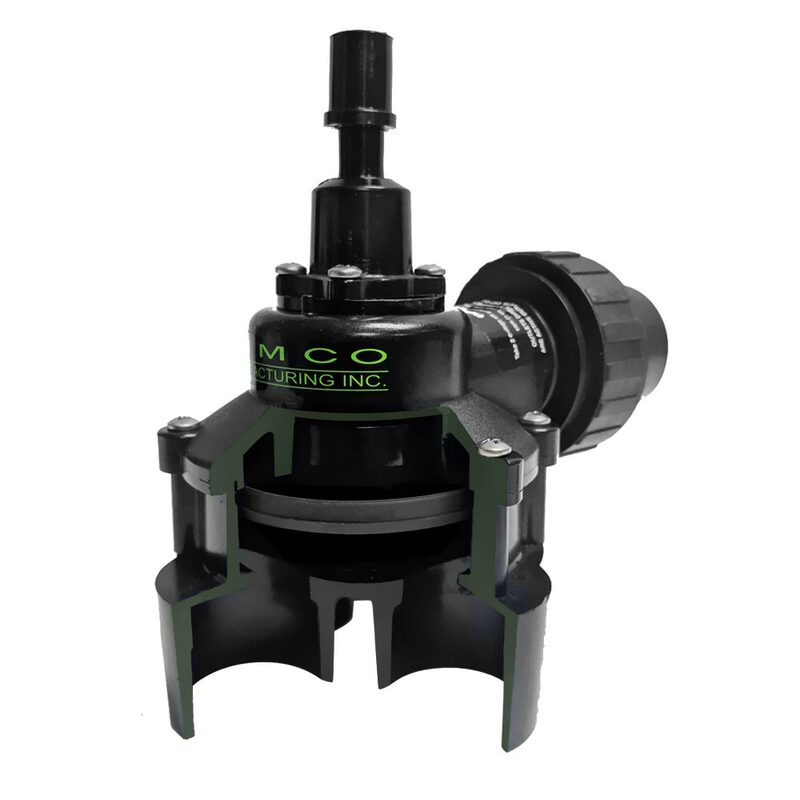 Since the FIMCO Hydro-Indexing Valve works on Water Pressure alone, you will never have to worry about Power Surges or Lightning compromising your irrigation system or wastewater system. The FIMCO Hydro indexing Valve is easy to install and even easier to use. One above ground Fimco Valve controls all zones eliminating the need to dig into the ground to locate electric solenoid valve boxes. The FIMCO Hydro-Indexing Valve works either manually or fully automatic with a controller to turn on and off the water supply (pump or solenoid). The FIMCO Hydro-Indexing Valve operates under most all water conditions. The FIMCO Hydro-Indexing Valve is preassembled with a sequencing cam which can be easily removed and replaced by a different cam if sections are added or eliminated. 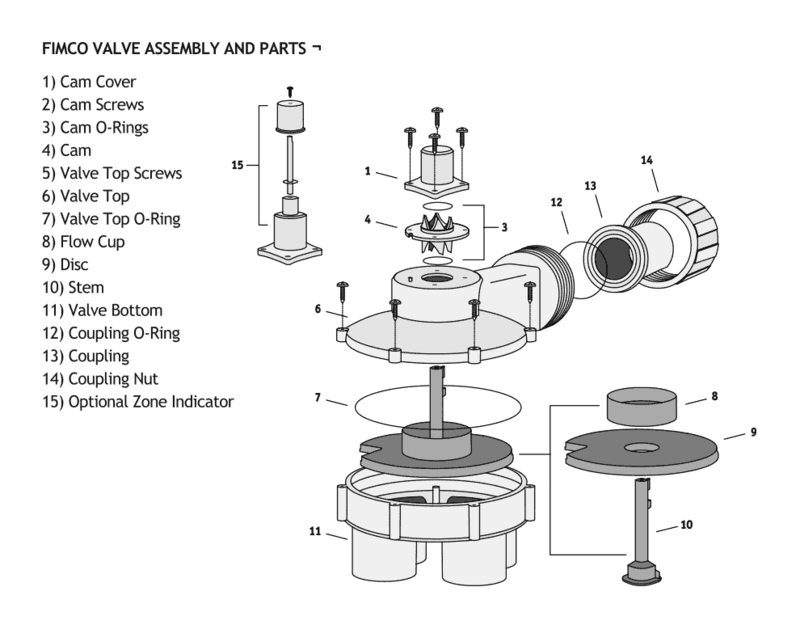 If you need a more detailed breakdown of the FIMCO Hydro-Indexing Valve, please see the parts diagram below.